Early on Sunday afternoon, with fingers sore from crimping the glassy boulders in northern Vermont's Smugglers' Notch, I came home and noticed a few personal messages pop up on my computer screen. Sunday afternoon. Messages. For some reason, the thought gave me an uneasy feeling. 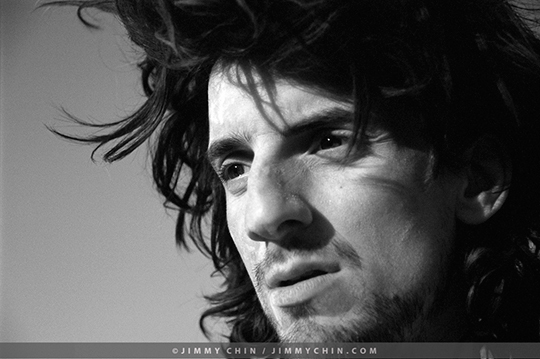 I walked over to the computer and read a note that told me Dean Potter and Graham Hunt were dead. 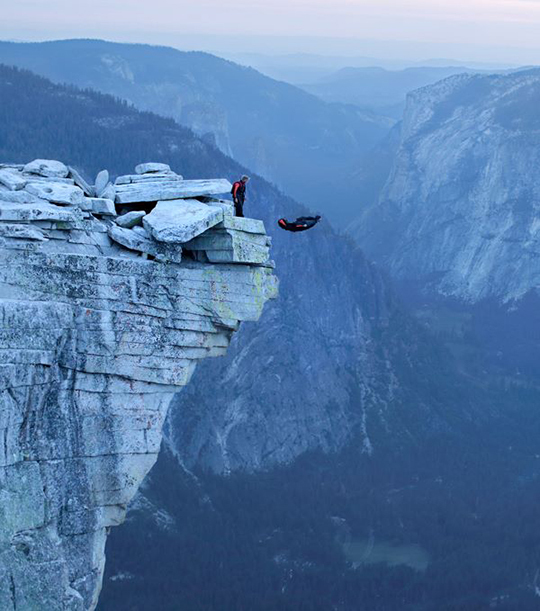 The pair had collided into one of Yosemite's walls while proximity wingsuit BASE jumping. Unable to process what I'd read, I spent the next several days contacting friends in Yosemite, a place that I had called home off and on for more than 10 years, seeking to reconnect. I knew professional athlete Potter, who was from New Boston, New Hampshire. Potter called Yosemite his home for 22 years, setting speed records on formations such as El Cap and Half Dome. He walked highlines both tethered and untethered, and climbed hard in Yosemite, Patagonia and the Alps. I didn't know Hunt personally, but his friend Shawn Reeder told me that Hunt was from Shingle Springs, California and had worked as a "Hot Shot [wildfire fighter] all over the west." Over the next few days, I talked with other members of the Yosemite climbing community who knew both Potter and Hunt, as we all remembered our friends who had passed. Yesterday, May 18, Jason "Coach" Lakey and Nicola Martinez called from a home at the end of Incline Road in Old El Portal about 20 minutes west of Yosemite's gates. They were next door to a house where Sean "Stanley" Leary, a longtime climbing and flying partner of Dean, once lived. On March 13, 2014, Stanley died proximity wingsuit BASE jumping in Utah. As we talked, it was raining in Yosemite, Nicola said. I imagined being there, marooned in the cold, the black, wet rocks reflecting light as clouds broke overhead. Hunt lived in Yosemite from age 22 to 29. "Grahambo [his nickname] was supposed to help me free Half Dome," said Lakey, who explained Hunt's natural climbing ability. "He could climb V8 and 5.12-plus. He's been hanging, living the life. No vehicle. No official job where there are taxes. No health insurance. Just living day to day to fly and hang out with [his] friends. He was keeping it pretty real. Last autumn, Graham took part in a 10-day meditation retreat with total silence and daily mediation. He was a person trying to improve as a human being, a person who wanted to be kind, giving and full of love. He was courageous and athletic, for sure, but also an enlightened being with little in the way of attachments to the material world." Lakey explained that Sean Leary was the one who turned Hunt on to jumping. One time, he said, Hunt flew through Horsetail Falls—a ribbon waterfall that catches last light only a few times a year and turns fiery red—on El Cap right at sunset. Then I talked with Ken Yager, who is often a spokesperson for Yosemite's climbers. "I've known Graham Hunt for about 10 years," he said. "He was well thought of, especially in the El Portal community. Both of the guys were a big part of this community, including to my daughter and all her friends. They looked up to both of those guys: That's the thing that makes this really hard here. I spent a lot of time with Dean. He used to visit me over the years, and he'd seen my kids grow up, all three of them. I climbed with Dean back when I used to boulder. [Once] I broke my leg [while bouldering with him] and he carried me out. I did the Nose with him in nine hours [during] the same year that he broke the four-hour mark on El Cap. It's the first time I climbed El Cap fast, even though we spent an hour at Camp 6 when we hit the wall. Then he got progressively quicker and quicker. I remember his feet were always trashed." "So sad, such a huge loss," wrote professional climber Beth Rodden from her home in Yosemite West. "[Dean] inspired so many, including me. He will be deeply missed. 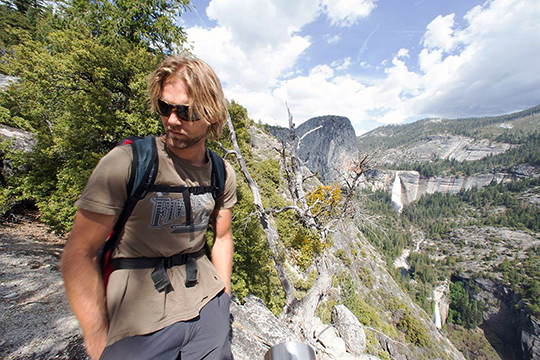 And his love and gratitude for Yosemite were incredible." Shawn Reeder, living in Nevada City, California, called Hunt "an amazing man. Graham was one of the most humble, inspiring, real, adventurous, loving, genuine people I knew; a true brother. We shared some of the greatest adventures of my life." Climber Sean Jones, who lived in El Portal from 1990 to 2008 and who now resides in Council Grove, Kansas, said he met Hunt at a climbing gym in Sacramento when Hunt was 21. They were both bouldering, and Hunt, after recognizing the band on Jones's shirt, came up and started a conversation. Jones soon learned that Hunt wanted to climb in Yosemite but didn't feel ready, so Jones took him under his wing and introduced him to members of the El Portal community. "They absorbed him," Jones said, "and he started teaching my kids to climb, and joined me on new 1,000-foot routes in Yosemite and on multipitch routes outside the Valley gates at Shuteye Ridge." Because Jones grew to care and trust Hunt so deeply, he asked Hunt to join him and his eight-year-old son, M'so, on their first climb together of El Cap's East Buttress. Later, they climbed on Colorado's Flatirons and desert towers around Moab with Jones's son. Jones named route near Shuteye Ridge after Hunt, calling it "First Blood"—to go with the Rambo, Grahambo theme. Back in the mid-nineties, I met Potter at the Sentinel Boulders, on the floor of Yosemite Valley, when I was in my late teens. The Sentinel Block, perhaps 30 feet high in places, sits in the shadow of 1,500-foot Sentinel Rock, which towers thousands of feet overhead. I was alone in the forest, piecing together moves along the rock when Potter showed up. He asked me for a spot on one of the steepest parts of the stone. I felt as if I were in the children's story "Jack and the Beanstalk." I was Jack and he was the giant. I stretched out my arms to protect him in case of a fall, my tiny body dwarfed by his until he reached the top. To descend, he reversed down a fallen tree that leaned against the boulder. The trunk rattled under his immense frame. At the base of the rock, we talked about climbing. He shared his desire to free solo Sentinel Rock, by the same route, the Steck-Salathe, on which Derek Hersey had died unroped in 1993. Then Dean was gone, and I was alone again in the boulders, still feeling as though I'd briefly slipped from everyday life into a myth. Yosemite is my home. I'm not there now as I write from Alpinist's headquarters, but the Valley is where I grew from child to adulthood and found community. Years after meeting Dean, I asked him why he repeated big-wall routes like the Nose. He told me to read the book Zen Mind, Beginner's Mind by Shunryu Suzuki. Hearing his advice, I began revisiting long routes in Yosemite and climbing them in a different style than before—with a different partner, different equipment or at a different pace, making them new. A year ago, when I was researching a story for The Guardian, retired BASE and proximity wingsuit jumper Chris McNamara told me, "It was the coolest sport in the world because it was an intense high. But once you get into it that high fades, and to keep that you have to push it, like flying closer to stuff, and that gets less fun. Then your friends start dying. I nearly died many times." Even everyday climbs can be full of uncertainty: an unexpected loose hold, a sudden storm. For Hunt and Potter, leaping off Yosemite's cliffs and sensing the air under their wings, the wind rush past their ears, their body taking loft, then pulling their chutes had become almost a part of their daily lives. And now they're gone. As I reached out to various people in our community, some remaining in the park and some scattered about, I sensed the reinforcement of the love we have for the area and each other. I felt the intensity of friendship that arises out of shared risk. Now, as I write, members of our tribe are driving to Yosemite. They're meeting at homes in El Portal, on the narrow, wooden bleachers at the Yosemite Lodge, and on the green, prickly grass in El Cap Meadow to be together and share stories from our climbing and flying days. Thanks for the nice story Chris. As always your words capture the spirit of adventure. Take care. Nullify their unjust law! Humans fly. it is the way it is now a days, to try to limit the freedoms of a man to say you must fly only in the worst of light conditions and once you lans scurry around like a rat in a hole hoping to not get jailed for your love of flight is WRONG! The National Parks "aerial delivery" law should not apply to a human being. Nullification is needed here, stand up to the system! Beautifully written Chris. With the media madness connected to Dean and Graham, it was uplifting to read your piece.